Counseling is defined as a professional relationship that empowers diverse individuals, families, and groups to accomplish mental health, wellness, and goals. If you are passionate about helping others, earning a master’s in Clinical Mental Health Counseling will help you advance your career while giving back to others, however there are many misconceptions of counseling as a profession due to the way counselors are portrayed in media. Below are some of the common myths associated with counseling as a profession. This is a common response you may hear when someone learns you are considering studying to become a counselor. A big myth is that counselors and therapists advise their clients on solutions to their problems. While not entirely incorrect, it’s not the counselor’s role to advise clients. Counselors may discuss various options and solutions with their client, but the client must arrive at their own decisions. 2. Counselors can’t help if they haven’t experienced their clients’ problems. This counseling myth is especially prevalent in the addiction counseling field. It’s a misconception that counselors can’t understand or help if they haven’t experienced a particular issue themselves, such as assault, substance abuse, or drug addiction. While it may be true that a counselor who hasn’t experienced addiction won’t know exactly how it feels, counselors and therapists are trained to provide valuable assistance to their clients. 3. Counselors must have their own lives in order. There isn’t a single person on this planet who has their life in order 24/7, 365 days per year. Counselors are people too, with their own struggles and personal problems. They also happen to have a passion for helping others work through their issues, and the training and emotional insight to maintain boundaries between their personal and professional lives. 4. Counseling is for those with serious problems. While people with severe mental health issues benefit a great deal from counseling, they’re not the only ones that do. Even mentally healthy individuals sometimes have difficulty coping with stress in their lives. It’s a sign of good self-awareness and strength to be able to recognize when it’s time to seek help and take the first steps toward healing. Counseling also helps with self-development and personal growth. 5. Counselors “analyze” their clients. While mental health counseling training helps counselors gain psychological insight, their goal is not to manipulate clients. Counselors guide clients in working toward their goals by providing insights and tools to help them analyze and reflect on various situations. 6. People will know you have problems if you see a counselor. Counseling is entirely confidential in most cases. This high level of confidentiality means that counselors cannot disclose patient information without permission. The Health Insurance Portability and Accountability Act, or HIPAA, is a national law that protects health information and ensures privacy. According to the American Psychological Association, there are some exceptional situations in which a counselor could disclose a client’s information. These include cases where clients pose a threat to themselves or others, if child abuse is suspected, or if a judge orders that their records be released. 7. Counselors just nod and repeat “I see” during therapy. The amount of engagement a counselor uses depends on the type of therapy a client needs. Counselors are usually engaged, asking questions and proposing different interventions during therapy. The stereotype that counselors remain silent while clients talk about their problems largely comes from the media’s portrayal of counselors. If you’re considering becoming a counselor, don’t let these myths deter you from following your dream. Counseling is a rewarding field for those with a passion for empowering others. A master’s in clinical Mental Health Counseling online provides an excellent start to making an impact as a counselor. 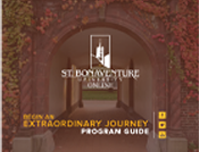 St. Bonaventure University’s 100% online program allows students to continue working while pursuing their degree.